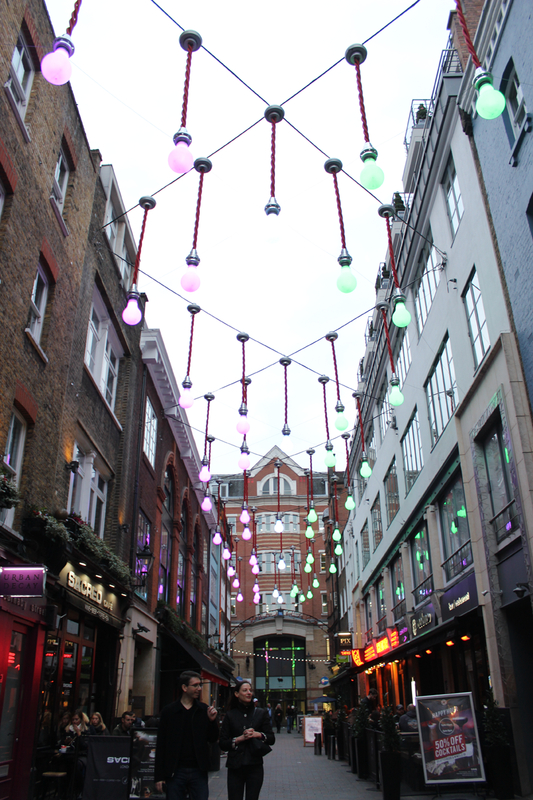 I’m back with another central London hideout – this time it’s one of my absolute favourite areas in London: Carnaby Street! Most people might recognise this street from its 1960s fame when it was a big destination for mods and hippies in the Swinging London scene – I so wish I could’ve been there! As much as I love Carnaby Street as it is now, unfortunately there’s not much left from its 60s legacy – although, if you know where to look, you’ll be able to visit the few mod & vintage shops that still remain, such as the lovely Sherry’s on Broadwick Street. Carnaby Street is right in the immediate vicinity of Oxford Street, with Oxford Circus being the closest station about a 5 minute walk away. When getting to the station, make sure to take the exit that says ‘Argyll Street’ – it will take you directly to the side street and let you avoid the horrific crowds that are pretty much always present around Oxford Circus station. Believe me, you’ll thank me for it! Carnaby Street is definitely more commercialised now than it used to be on its glory days, but the shops here tend to still be smaller brands than the ones you might find on high street, such as Scotch & Soda, Monki (my favourite brand!) and Kooples. Most of the shops here are bit on the pricey side so I generally tend to just do a lot of window shopping, but for example Monki is super affordable and all of the clothes I’ve ever bought from there have been really good quality too – win win! The atmosphere for shopping here is a lot more relaxed than in the nearby Oxford Street – people don’t seem to be in such a big hurry and are generally nicer to each other too. I guess when you don’t have to elbow your way out of a crowd it’s a lot easier being a nice human being! For coffee and cake, you can’t beat the lovely Sacred Cafe on Ganton Street for amazing loose leaf tea and friendly atmosphere. They have their own Sacred tea plantation in Sri Lanka and their coffee is brewed in a fair trade farm in Nicaragua – the owner himself (originally a New Zealander, now a Londoner) has been to visit the farmers first hand a few years ago to make sure their working conditions are up to standard – pretty great, huh? If you’re after something a bit more savoury than tea and cake, worry not – Carnaby Street is especially amazing when it comes to dining options. My favourites are The Rum Kitchen (there’s also one in Brixton – you can read my review here), Whyte & Brown (primarily a chicken restaurant but they have some veggie options too and the drinks are a-ma-zing!) and Carnaby Burger Co. If you don’t really know what to go for, I would recommend starting off at Kingly Court which is absolutely full of different eateries, but also small enough to quickly peruse different menus before making the final decision. One other place I absolutely have to mention is one my favourite cocktail bars, Cahoots, in Kingly Court. Cahoots is a 1940s style prohibition era bar built into what looks like an old London Underground station and it is SO cool! All the staff inside are in character, wearing era-appropriate clothing and the cocktail list is made to look like an old newspaper from 1940s – I just absolutely love it! Every single cocktail I’ve ever had here has been amazing and I feel like they really have something for everyone. Cahoots is definitely a special experience that I would recommend everyone try out at least once!